3.1 What Area Do You Need To Heat? 3.2 How Much Power Do You Need? 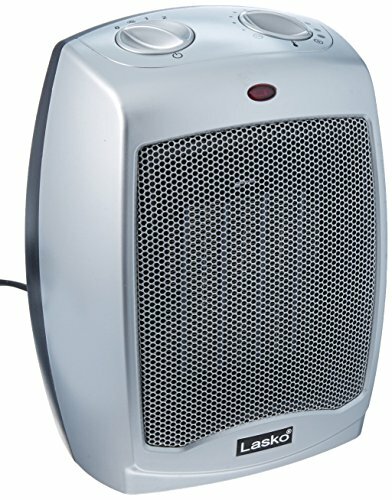 7 Do Space Heaters Save Money? Whether you already have a central heating system in place or not, you should consider purchasing a supplemental heater to provide additional heat in your room when you need it. A space heater offers many benefits, especially lower heating bills, as you’ll only need one heater and not the entire central heating system. 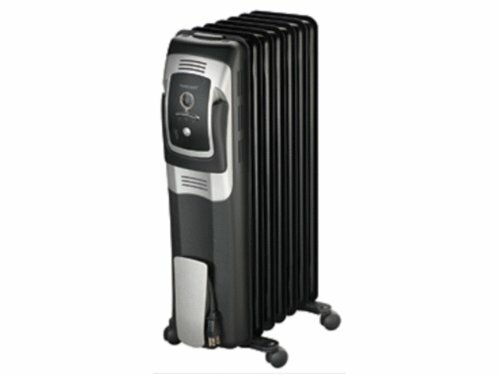 There are also a huge variety of space heaters that you can choose from too. Because it can get pretty daunting when you’re looking at all the choices that are available, we have included some space heater reviews so that you can find out about some of the most popular models on the market. We’ve also added some comparison tables for you to have enough information to choose the best space heater for your home or workspace. Remember to stick to your budget and consider the cost of powering the heater as well as the initial cost of purchasing the heater. 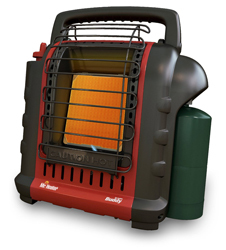 The Mr. Heater F232000 MH9BX Buddy heater is a highly portable radiant heater that provides functionality and convenience to your home or job site. It doesn’t require any cords so it can be used anywhere. You can also be sure that it will be completely safe for you to use as it has plenty of safety features built in. If you want to carry it around from room to room, you will be able to do so with ease thanks to the folding handle that simply folds down when it is not in use. It is also relatively small and lightweight so that you can carry it comfortably. A low oxygen shut-off ensures that the heater will turn itself off when the oxygen levels fall too much and it also has a tip-over safety shut-off which will turn the heater off if it senses that it has been knocked over. This heater outputs between 4,000 and 9,000 BTU, depending on the heat setting that you want to use. This can heat a medium-sized room comfortable whilst also being suitable for a smaller room if you turn down the heat output level. 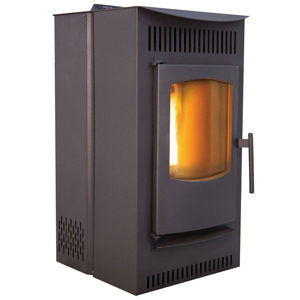 The piezo ignition allows you to start this heater up easily and the temperature control dial is also easy to operate. Here we have a compact product designed to warm up quickly and evenly small-sized rooms. The Comfort Zone’s space heater has an elegant shape, and its characteristics will come up to your expectations. The unit comes with 3 heating modes and extra ECO mode. Also, the temperature can be set from 41°F to 90°F. 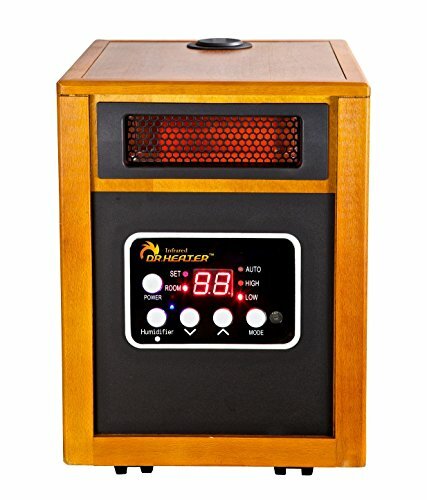 Moreover, this neat space heater can be adjusted to move repeatedly from side to side at a 70°angle while blowing uniform warm air around your room. And in case you do not need this function, you can always turn it off. Other practical features include the 8-hour timer for turning off the unit when the desired temperature is reached and the remote control which has a special storage place at the back of the heater. As for the safety properties of this product, we can say that the Stay Cool feature is among our favorites. This function stops the front grill of getting too hot and hence prevents burns if somebody touches it. There is overheating protection as well as automatic shut down if the heater is tipped over. Nevertheless, you may notice that the plug can get really hot while the unit is on. 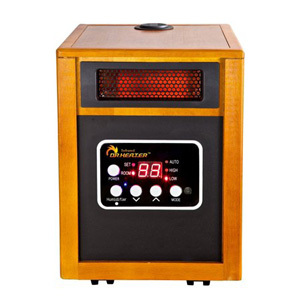 If you’re looking for a high quality portable infrared space heater, then the Dr. Infrared Heater Portable Space Heater with Humidifier is a great choice for you. You can take advantage of the many great features including the digital thermostat and display to the front of the unit. With a wooden body and vintage looks, this is a heater that not only functions well, but it looks great too. It will be a good-looking addition to your home and can provide a comfortable and powerful amount of warmth. 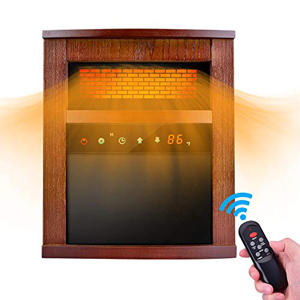 As this is an infrared space heater, you can be sure that you’ll get the full benefit from the infrared waves rather than the heat being lost to the air in the room. If you sit in the front of this heater, it will gently emit infrared waves to warm you up, like the rays of the sun on a warm day. Infrared heaters are often more favorable than many other kinds of the heater as they do not dry the air out in the same way, but even so, winter air can be naturally quite dry anyway. If you feel that the air in your room is making your nose and sinuses feel uncomfortable, you can use the humidifier to create moisture in the air so that the humidity can be replaced. If it’s a stylish and modern looking electric wall heater that you’re looking for, you should check out the Cadet Manufacturing 79241 wall heater. 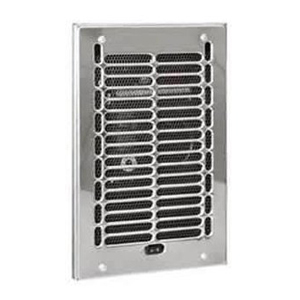 This is an electric space heater that must be mounted into the wall with a grille that is placed over the heater. The heat is forced out of this heater using a fan, which ensures that the heat is distributed evenly and quickly, warming up space in no time. The polished chrome finish of the grille offers a modern appearance to your home whilst the heater itself is practical and can be used as a bathroom heater or for other damp areas if you wish. Unlike some wall heaters that include only the heating element and grille, this one comes with the mounting can so that it is ready to install on the wall as soon as you receive it. Instructions are included so that you can install it for yourself if you are confident enough to do so. 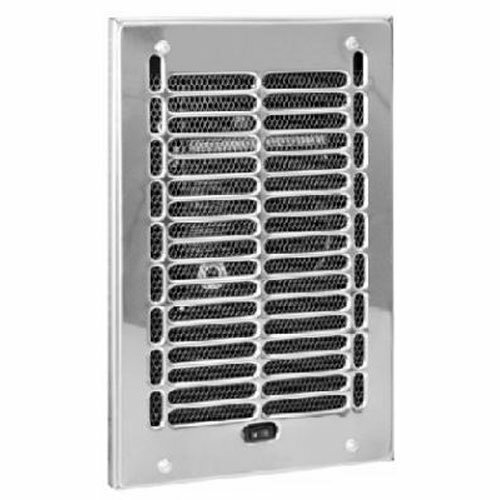 The grilles will not become hot, but you should be aware that this is a heater that is best for small space heating. With just 1000w of energy powering it, you can expect it to perform better in smaller bathrooms and well-insulated spaces. The Castle 12327 Serenity Wood Pellet Stove with Smart Controller is a highly efficient pellet stove that can heat your entire home. The smart controller is a great finishing touch, which allows you to choose from modes including manual, thermostat and weekly to make this heater as automatic as you want it to be. The way in which this stove heats the fuel ensures that less fuel is wasted. The stove itself is compact, which enables the various heat exchanges in the system to operate in a small space. This ensures that less heat is lost in the process. The design also means that you will have to clean it less than you think. The inside of the stove is smooth so that ash does not build up so well in it. The lack of the maze of tubes in this pellet stove means even easier cleaning. Other stoves rely on a complicated maze of tubes to transfer the heat, but this leads to clogged pipes and difficult cleaning operations. Instead, all you need to do is clean the basic parts of this stove. The parts for this stove are also easy to get hold of so you can be sure that you’ll be able to have it repaired if anything should go wrong. 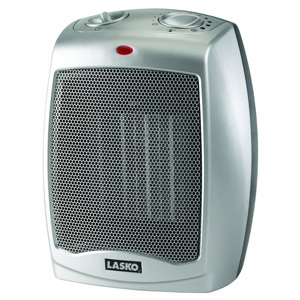 With a ceramic heating element, the Lasko 754200 Ceramic Heater with Adjustable Thermostat is a handy portable appliance that will be reliable and durable for many years to come. The heater function allows you to choose from 1500-watt full power or you could choose the lower 900-watt power setting if you only want a gentle amount of heat. When the weather improves, there’s no need to need to put this appliance away. You can turn off the heat altogether and simply use it as a fan. All three of these settings are quiet and don’t produce an unpleasant amount of noise. The thermostat on the side of the heater will ensure that your room stays the desired temperature and it automatically shuts off the heat and then powers it back up again as it needs to. Unfortunately, however, as this is a cheaper model, it is lacking in a couple of useful features, such as a digital display and programmable controls. 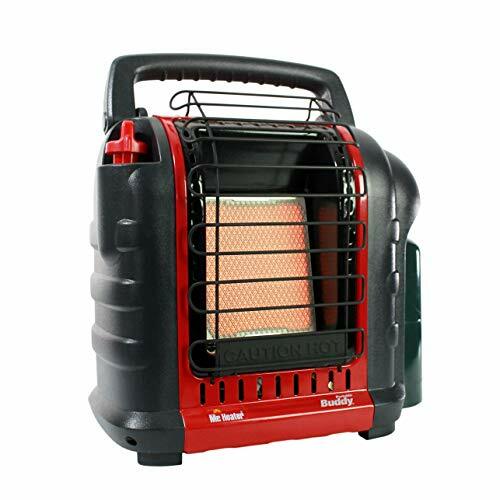 This is a portable heater that comes with a carry handle. You won’t have to assemble it at all and it is ready to be used straight away. This heater does not have any mounting holes, so you will not be able to hang it on a wall out of the way. Instead, it is designed to stand on a flat and level surface. As this fan draws in cool air from the back and expels warm air at the front, you should be careful not to obstruct either the front or the back of this heater and allow a good amount of clearance. You may also be interested in Propane Heaters! Capacity: up to 500 sq. ft.
You can set the temperature from 59 °F to 86° F as well. What is more, the overheating safety feature will turn off the unit if it reaches 105° F. Another great option that you will get with this electric heater is the tip-over safety feature which will stop the work of the product when kicked down. And the fact that you can remove and wash the filter at the back is a significant advantage since you can prevent it from clogging with dust or fine particles enter the inside of the heater. There are comprehensive instructions in the manual of how to remove it and clean it as well as a recommendation to do this in every 3 months. However, the unit is manufactured in China, and perhaps this is the reason why you may experience some difficulties when trying to find replacement parts. Big rooms require more heating capacity, and if your current heating device is not enough for you to have comfortable room temperature, then Mr. Heater’s unit is the perfect deal. With its 30000 BTU, this product will provide nice warmth in the space of up to 750 sq feet. 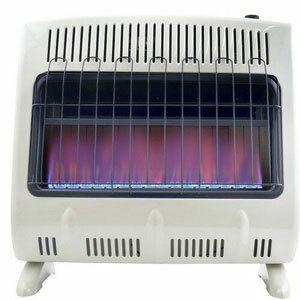 What is more, this heater is ideal for supplement heating and does not need electricity socket to be plugged in since it works with natural gas. Also, it comes with ODS technology to guarantee your safety while turned on and a dial thermostat that can be adjusted from 0 to 6. What is more, the temperature settings to choose from vary between 60 °F and 118.4 °F. And another thing you will surely like is the electronic igniter to turn on the pilot lit. Nevertheless, it is a standing pilot, not electronic and hence, you will have to manually switch the control knob to 0 to turn the heater off. Furthermore, this heater cannot be converted to propane, and you will not be able to use the unit at a place which is 4500ft above the sea level. But the overall heating performance of this blue flame product will not disappoint you by giving you comfortable and instant warmth. The cooling function of this unit is probably what sets it apart from all other heating products on the market. The TRUSTECH ceramic heater comes with 2 fan settings to warm up your room for less than a second and temperature ranges from 50°F to 95°F. Also, the 23-inch-tall heating unit has a carry handle for natural movement from one room to another. Also, there is an 8-hour programmable timer for turning off the product as well as an oscillating function for blowing cool or warm air from side to side. Moreover, you can control all these features while watching TV in the other corner of your living space by using the remote that comes with the heater. Nevertheless, the beeps can be louder than you might expect and we are sad to say it, but you cannot turn off the sound. At least the heater is extremely quiet while operating and that makes it perfect for bedrooms or working places where silence is of great importance. 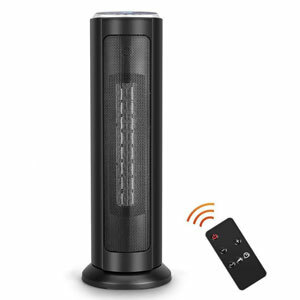 Another practical feature of this portable ceramic tower heater is the programmable thermostat with which you will even be able to consume less energy. If you are looking for a swift way to warm up your cold living space, then TRUSTECH Air Choice heater might be the answer. 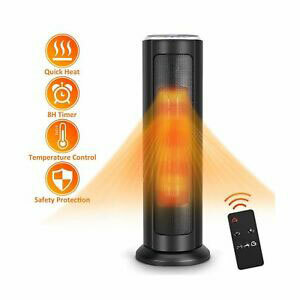 This product will change the temperature in the room for no more than 3 seconds using its high-powered mode at 1500w. And when you feel content with the desired heat level, you can always switch to the 750-watt mode to maintain the room temperature. There is a cooling mode as well, and hence, this unit will give you the chance to choose from 50°F to 95°F. In addition, the electronic thermostat will keep the temperature just the way you have programmed it. What is more, the 70° multi-angle circulation of air will speed up the heating or cooling as well. Another significant advantage is the safety features – there is overheating and tip-over protection. However, the cozy heat this product radiates cannot be spread that well across your room because the fan is not that powerful. Furthermore, this tower ceramic heater warms up small rooms best or if you are close enough to it. As for the quality, this heater has passed all the tests run in the Electrical Testing Laboratory, so it is going to be a long-lasting purchase. This top rated oil filled radiator is a convection heater that can provide you with a durable product, and some useful inbuilt features. So that you can conserve heat when you don’t need the heater to be at full power, you can choose from 3 different heat settings. This also lets you decide how warm you want your room to be for comfort. In addition, the Honeywell radiator ensures that the temperature is maintained in your room by cutting out the heater when it gets too warm and warming up again when the temperature starts to drop. The radiator is made from solid heavy gauge steel so that it will be able to withstand high temperatures and even knocks. It also has a rust free finish that is made from enamel. There is no way that the oil could leak from the heater as it is welded by machine and it has a power indicator light to let you know if it is on. You can decide how long you want the heating to be on for. There is a timer that is inbuilt and this allows you to set the heater to run for up to 12 hours. With a 3-year warranty, this heater is guaranteed to last you for a few years so that you can have peace of mind with your purchase. Multiple fan settings allow you to control the speed of the fan as well as choosing a more energy-conserving option when you don’t need such intense heat. The ceramic heating plate to the center of these types of heaters ensure that plenty of heat is produced whilst ceramic is a strong material that will be certain to increase the longevity of the heater. Ceramic heaters come in all kinds of shapes and sizes so that you can choose the right one for you. Whether you want to heat a large room or space such as a warehouse or garage, or if you simply want some comfortable and supplemental heat in a room in your home, there are plenty of different options available for you to choose from and suitable for a wide range of uses. Check out the top-rated garage heaters here. Radiant and infrared heaters work completely differently again in comparison with convection and fan forced heaters. These heaters radiate heat forwards towards the objects that are in front of it. Rather than warming up the air, radiant heaters warm up objects so no energy is wasted. One of the problems with this kind of space heater is that they are only suitable for heating smaller areas of space. If you want to keep your entire room warmed up, they’re probably not suitable but for a small part of the room with one or two people sitting in close proximity, they are energy efficient space heaters and a comfortable way of providing heat. These space heaters are a great choice if you want a heater that can be mounted safely in your room. They are not designed to be portable, but instead, they are installed at the bottom of a wall, close to the baseboard and emit heat using an element and a fan. As these heaters are longer than most other heaters, they provide a wide stream of heat and they can heat a room up in just a few minutes. Using an integrated or optional thermostat, you will be able to control the temperature of the room with ease. Electric baseboard heaters are usually cool to the touch when they are on so they are suitable for households with pets or children. Convection heaters are low maintenance so that you will not need to worry about the heater needing to be serviced regularly. They also don’t need to be refilled. As most convection heaters don’t need a fan, they are very quiet and don’t produce an unpleasant noise. They are great for all rooms of the house including the bedroom because of this. As convection heaters warm up on the outside as well as the inside, they become hot to touch. You should be wary if there are children or pets in your home and you may need to install a safety guard. Convection heaters take a while to heat up so if it’s instant heat that you want, these space heaters are probably not for you. They heat the room quickly. Plenty of optional features means that these heaters are highly versatile. You can set the speed of the fan on most of these kinds of heaters, allowing you to add a lot of heat quickly to your room or choose a more comfortable heat with a lower and more energy efficient setting. Also, view our reviews, and browse our buying guide to find the most energy efficient window air conditioners you can purchase on the market. Thanks to most of these heaters having a cool touch casing, they are usually safer for pets and children than other options such as convection space heaters. The ceramic heating plate is durable and effective. Can be expensive to run for longer amounts of time. The room will cool down very quickly when the heater is turned off. Heats up objects rather than air so that energy is conserved. You have to be in close proximity to these heaters in order to benefit from their heat. Not suitable for heating up large rooms or spaces. Can become less effective if the heat flow is restricted by furniture. As these heaters emit light as a heat source, they are not suitable for bedrooms and may be an annoyance if you want to create ambient lighting. They are fast to warm up the room thanks to using fan forced heating. They can be fixed to a wall for safety. They are also cool to the touch. When you switch the baseboard heater off, you will usually find that the room will cool down very quickly. When you are looking for the right space heater for your needs, it is important that you consider all the additional features that you may need to find the perfect home climate. Portability – Do you want the heater to be portable, or does this not matter? If you will be using the heater in the same room at all times, it may be safer and more convenient to install a wall or baseboard mounted heater. On the other hand, if you want to have a portable heater that you will be able to take from room to room in order to provide supplemental heat in the rooms in your home. You may also like to read about the best portable air conditioners and the smallest air conditioners. Oscillation – If you want to heat up the entire room quickly, it may be a good idea to choose an oscillating heater. These rotate as heat is fan forced around the room. In the summer months, you can sometimes choose to turn off the heat feature and simply use this kind of heater as an oscillating fan. Comfort – If you often find that forced fan or convection heating methods are too harsh, you could choose radiant or infrared heat. These are more natural feeling heating methods and they won’t dry the air out as other heaters do. This will enable you to feel more comfortable whilst the heater is in use. What Area Do You Need To Heat? When you are considering which heater to use, you should always consider the size of the space that you will need the space heater to warm up. If you have a larger room, for example, you will probably benefit more from a fan forced heater. You can find larger industrial sized heaters that can provide heat quickly to the room and maintain the circulation to keep the larger room warm. On the other hand, if you live alone, you will be able to save money on your heating bill by choosing an infrared heater. The amount of power that you will need may vary from room to room if you are going to be using the heater throughout your home. If you simply want to heat a single room and use a more permanent space heater, you will be able to accurately work out how much power you need to heat the room. On the other hand, if you want to take the heater from room to room, you should look out for the heaters that have variable power options so that you can conserve energy when you don’t need the heater to be so powerful. 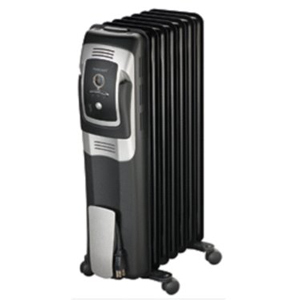 Cost doesn’t need to be a problem when you are looking for a space heater, as there are all kinds of space heaters available to suit many budgets. Whether you want something basic, or a more feature-filled heater, you are bound to find something that will suit your needs. You should remember that the initial cost if purchasing the space heater would not be the only cost that you’ll have to consider. Think about the cost of running it. Electricity can be expensive, especially if it is used wastefully by using a heater that is too powerful, or a heater that needs to be on the whole time without actually ever heating the room up as it is insufficient. Affordable – Space heaters are affordable to purchase, require little or no setup or installation and they can save you money on your current heating bills. 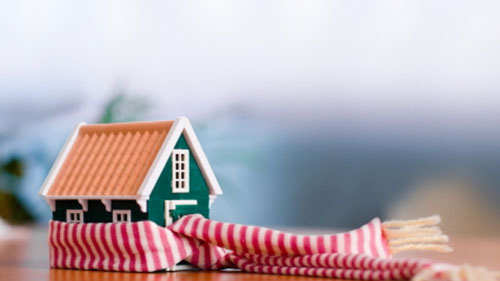 If you have a central heating system that you switch on to warm up a room, you will be undoubtedly wasting energy, as you only need to heat one room. With a space heater, you only need to heat the room that the space heater is in, saving money. Portable – Portability is important to a lot of people. If you are buying a space heater for your home, you will be able to choose portable models that are really easy to simply pick up and move around. If you don’t need to move the heater from room to room, you could also choose a wall mounted or baseboard heater so that you can mount the heater out of the way to make it safer and more permanent. Safe – Space heaters are designed to be portable and as such, they are also designed to be safe. You will find that the one that you choose may have an anti-tip switch that will cause the heater to turn off if it senses it is no longer upright. If the heater uses fuel for power, it may also have a low oxygen level sensor. This will ensure that the heater turns off if the oxygen level in the room becomes too low. Quiet – Some space heaters have a fan to force the heat around the room whilst others use convection currents or radiant heat to provide warmth. Whilst there is some fan forced heaters that are a little noisy, you can be sure to find plenty of space heaters that are almost silent whilst they are on. This will allow you to use them in your bedroom or anywhere that you need a quiet atmosphere. Versatile – Whether you are heating a small space and need an infrared heater to provide zonal heat, or if you want to heat up a large room or workspace and purchase a fan-forced heater to do this, you will always find a heater that is suitable. There is plenty of choices when it comes to the different kinds of heating methods that space heaters use and you can also choose from a diverse range of shapes, sizes, and designs. This makes space heaters a highly versatile choice. Effective – Even though space heaters are relatively small, they offer a surprisingly large amount of heat, and you will find that even the most portable of space heaters can be quite effective when it comes to heating your home. Controllable – Some space heaters can be controlled with more options than simply being on or off. You are able to turn the speed of the fan down on fan forced heaters, whilst other heaters come with a manual or digital thermostat too. This allows you to conserve energy whilst still heating the room to the temperature that you need. Some of the more advanced heaters even come with a remote control so that you don’t even have to get up to change the settings on the heater. You should always choose a heater with a thermostat. 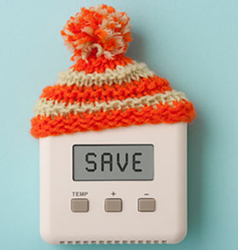 A thermostat will keep your room at a constant temperature, but it will also ensure that your heater never gets hotter than the temperature setting that you choose. Overheat protection is another important safety feature to include with any space heater. Overheating can lead to fires, but it can also lead to the premature failure of parts in the heater. Overheat protection will ensure that your heater will cut out before it gets to the point where it would overheat. This will improve the durability of your heater. When you buy your heater, you should take care to ensure that is has been approved by an independent testing lab. This will give you peace of mind that the appliance has had thorough safety checks. Remember that heaters get hot very quickly. They need plenty of room around all sides to ensure that the heat can be deployed around the room. In order to ensure the best possible clearance, you should leave a clearance of around 3 feet. This includes people who may be nearby. You will still be toasty and warm if you stay more than 3 feet away from the heater. To prevent the heater from being knocked over easily, you should always stand the heater on a flat and stable surface. Do not stand on piles of clothing or on a bed, as this can be dangerous. You should always try to avoid using an extension lead with your space heater. Whilst the cord that comes with your heater will be perfectly safe to be used at all times, it is not a good idea to use a standard home extension lead with a space heater. The amount of electricity that is needed to power the space heater means that you would need a well-shielded extension cable. If you must use an extension cable, you should purchase one that has been made to withstand the demands of plugging in an electric space heater. You should always be prepared to need to make a quick exit from a room. Whether the mailman knocks on the door, or if the smoke detector starts to sound, it’s not uncommon to need to leave the room in a rush. For this reason, you should always ensure that your space heater does not obstruct the floor. Keep it out of the way of any walking areas and give plenty of room to step around the heater if you do need to put it in the path of a door. Finally, it may seem like common sense, but you should always supervise small children and pets when a space heater is on. Never leave the space heater unattended when you leave the room, and if you do need to leave the room, you should switch off and unplug the heater. When you are thinking of where your heater will go, you should ensure that you position the heater in a sensible place. The position of the heater should take a few things into consideration including the clearance around the heater and important safety tips. Read on to find out more about positioning your space heater. 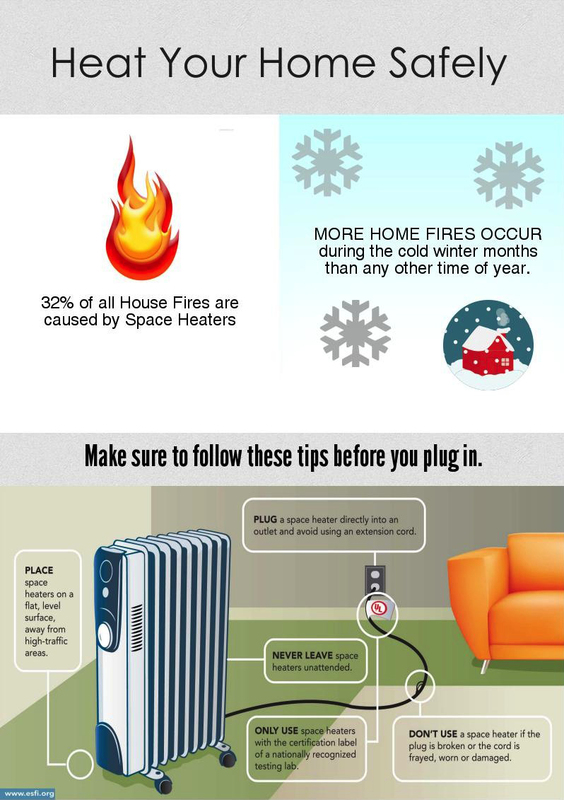 When you use your space heater, the last thing that you want is to put yourself or your family in danger. When you’re done, check our tent air conditioners, and heaters for camping that you can safely put inside of your tent. Flat Surfaces – Are Best Before you put your space heater anywhere, you should make sure that it will be on a flat and level surface so that it can’t be knocked over easily. Plenty Of Clearance – You should also make sure that you don’t allow the heater to be obstructed by anything. Unless you have a wall mounted heater, you should keep the space heater around 2-3 feet away from the wall at a minimum. There should also be nothing to the sides or front of the heater for another 3 feet. Mounted Or Portable – Is your space heater designed to be portable or mounted? Mounted space heaters involve either mounting the heater into the wall or mounting a baseboard heater towards the bottom of the wall near the floor. Mounted space heaters can be safer if you have children or if there are pets roaming around the home or your workspace. They are usually cool to the touch, but you should still ensure that they are not being obstructed by anything. The main thing to remember when you are installing your mounted heater is to ensure that the flow of heat from it will not be obstructed by walls or furniture. If you have a portable space heater, you should be careful not to place it anywhere where it could be knocked over. Shelves and tables are the worst places to stand heaters. Keep Moisture Away – Although it probably goes without saying, space heaters mainly run on electricity and as a result, they are not safe to use in damp areas. Do not take your space heater camping and don’t be tempted to use it in the bathroom or kitchen or indeed anywhere else where it may become wet. There are some heaters that are usually wall or ceiling mounted that can be used in the bathroom, but if you wish to use one of these, you should be very careful to install it correctly. Another source of moisture is damp clothes. Many people are tempted to dry their laundry by hanging it over a space heater, but this is incredibly dangerous. Not only is there a hazard posed by the moisture in the damp clothes, but you will also be obstructing the surface of the heater, which can start a fire. Check out our selection of the air purifiers for smoke and air purifiers for pets. Clear A Path – So that you can walk through your home safely and to keep children or pets safe whilst the heater is being used, you should always ensure that you place the heater out of the walking path of the household. Ensure that there is enough room to move around without the possibility of the heater being knocked over. For more information about how to keep the air inside as clean as possible, you should definitely check out all the practical advice in our air purifiers for allergies guide, the dehumidifiers for your basement and the ultimate purifiers for mold. Whether or not your room heater will save you money on your energy bills is dependent on a variety of factors. Let us take a look at the ways in which you can ensure that your space heater will save you money to help you choose the most economical space heater for your home. When you are looking for the right space heater, you will first need to think about what you want to achieve. Do you already have a central heating system and simply want to use a heater instead of using the entire central heating system, or do you have no heating at all and need to install some heating in your home or workspace? If you are using the space heater as supplemental heat, you should ensure that you turn off your central heating system whilst you are using the space heater. If you have both the central heating and the space heater on together, you are simply going to waste money. 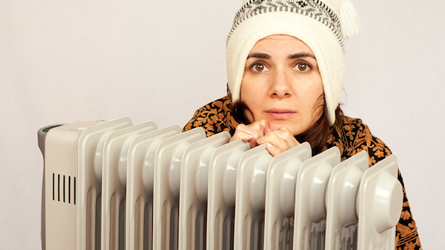 If you have no heating at the moment, you should ensure that you choose the right kind of heater. Running a fan heater frequently will cost you a lot of money and isn’t likely to heat your entire home. Instead, you could choose a baseboard or wall mounted heater or convection heater. If you want heat immediately, you should choose a fan heater or an infrared heater. These heaters provide heat immediately, but you should remember that they would not stay hot when you turn them off. If you want a heater that will keep the room warmer for longer, you should choose a convection heater. The problem with these heaters is that they take a long time to heat up and won’t provide effective heat if you have a drought or poor insulation. The best way to save money on your heating is to survey the areas that you wish to heat up before you buy your space heater so that you can purchase the best possible one for your needs among our top-rated space heater reviews. Don’t forget to also check out our list of best-selling gas fireplace inserts of 2019. Keep cool this summer with our buying guide to the top-rated tower fans to make an informed choice. Find tips on how to choose the best ceiling fan. We also answer common questions to help you choose your bathroom fan, window fan, and evaporative cooler. Freezing in your car? Here’s what to look for if you want to buy a portable car heater. As you can see from these space heater reviews, there are so many types and models out there that you’ll be quite positively spoiled for choice. Whether you want the best electric space heater, a radiant or infrared heater, a patio heater, a wall or baseboard heater or a portable kerosene heater, we’ve made some great suggestions for you. Of course, there are plenty more space heaters out there too, so if you were still looking for something to suit your needs better, we hope that our top-rated space heaters buying guide have been helpful in helping you to make up your mind. Whatever you choose, make sure that you follow sensible safety advice and that you remember to turn the thermostat down when you don’t need too much heat. 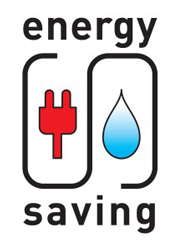 You should also turn off the central heating system if you want to make sure that you save money on your energy bills. If you consider all these points, we’re sure that you’ll find the best space heater for your needs.